The hardcover and e-book editions of this book were released May 3, 2016. The Mass Market Paperback Edition was just released on May 2. What should have been a quiet and relaxing day for Helen Hawthorne and her friend Margery quickly turns deadly. The were touring Bonnet House, a Fort Lauderdale museum, and when the left they were witness to a woman falling down and convulsing in a parking lot. She later died and her death was very suspicious, but was it murder or suicide? Helen is asked to investigate her death and goes undercover to do so. Phil has his own case. He is trying to catch a thief that has been burglarizing high rises. Busy with their own cases they don’t have much time for each other. Hopefully they can wrap things up before their marriage starts to suffer. Fifteen books in and Elaine Viets still delivers a timely mystery we can escape right into. Helen has come a long way from the dead end jobs as she takes on another case all by herself and she ends up helping Phil with his case too. Phil ends up the one with the dead end job in this installment. I did figure out the whodunit in her case quite easily and some of the facets of Phil’s case too but both had a suspenseful endings. All our favorite characters and their “sunset salutes” are back. I did enjoy Markos helping the PI’s again. The new characters were interesting and well developed. Their dialogue was well written too and real. 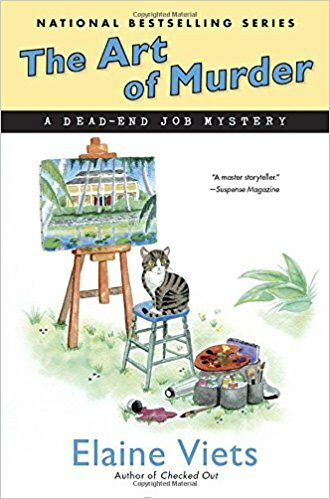 The Art of Murder is a light, fast, enjoyable cozy. A nice addition to this series. I am giving away my hardcover review and 1 paperback copy! I love books by Elaine Viets! Thanks. A super series but I’m way behind!